A month ago, I got a flier from our mailbox regarding a “helloween” celebration in our community. I was excited and curious at the same time, since it sounded like a typical western halloween celebration, save for the fact that it wasn’t going to be celebrated on Oct 31, but a couple of days earlier. Whatever the reason for calling it so and picking out the date, it was one event that I was glad my family participated in. As I have mentioned in previous entries, we live in a small community just outside of the city and close to the woods. Aside from its idyllic location, what I love most about this place is the atmosphere and the friendliness of our neighbors. We are the only multi-cultural household in this area, but that didn’t seem to make a difference in how we are treated by our neighbors. Now back to the “helloween” celebration. The event was held in one of the unoccupied vacant lots. Everyone brought their own food to share. I managed to whip up some chocolate cupcakes sans the halloween design. But who cares, it’s edible, right. 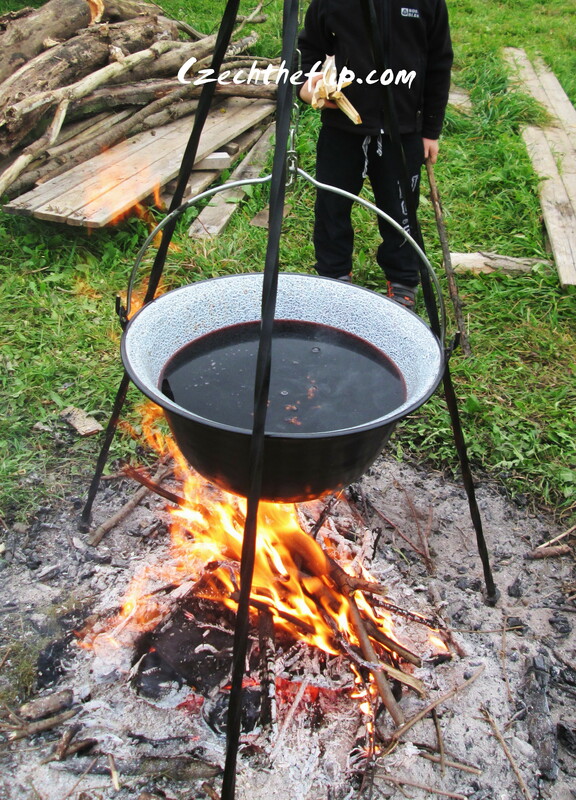 There was also hot red wine for those who were chilly. This is a typical autumn and winter drink here in Czech. I remember when we used to go skiing in California, my ex-boyfriend (now husband) is always left with the task of making this drink for the group. 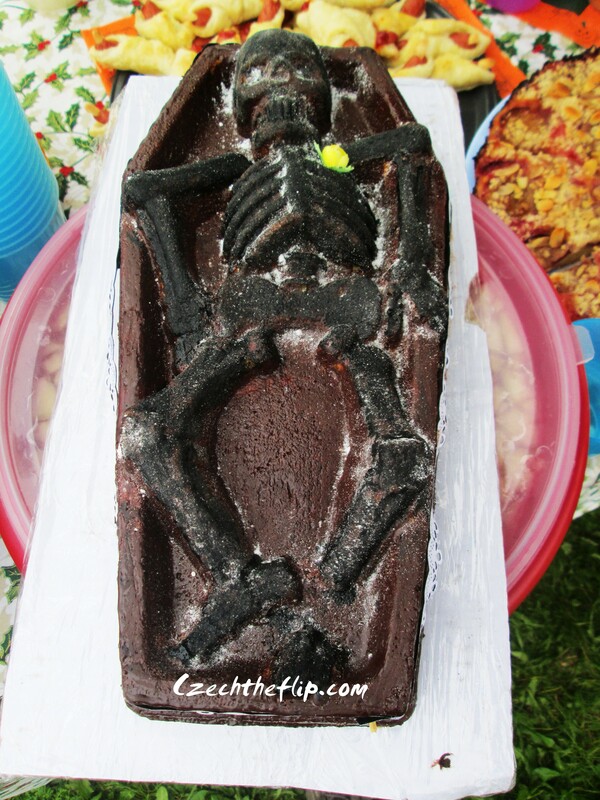 And of course, halloween-themed treats … In my opinion, this is the best of them all. 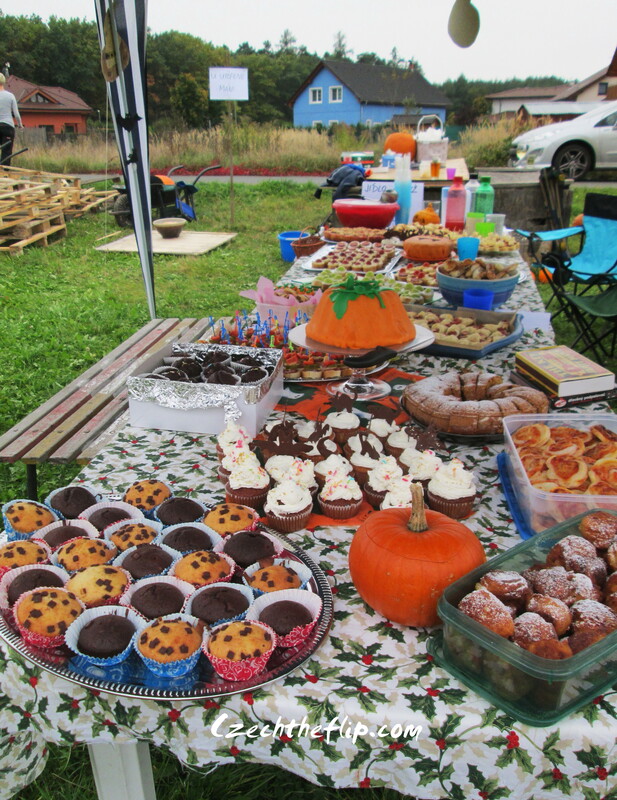 The event started with pumpkin-carving where kids eagerly carved their own pumpkins with the help of their parents. And of course, some parents were all game and came in costumes. Then there were games for everyone to participate in. My Michaela was way too young to participate in any of these, but she was all happy watching it. 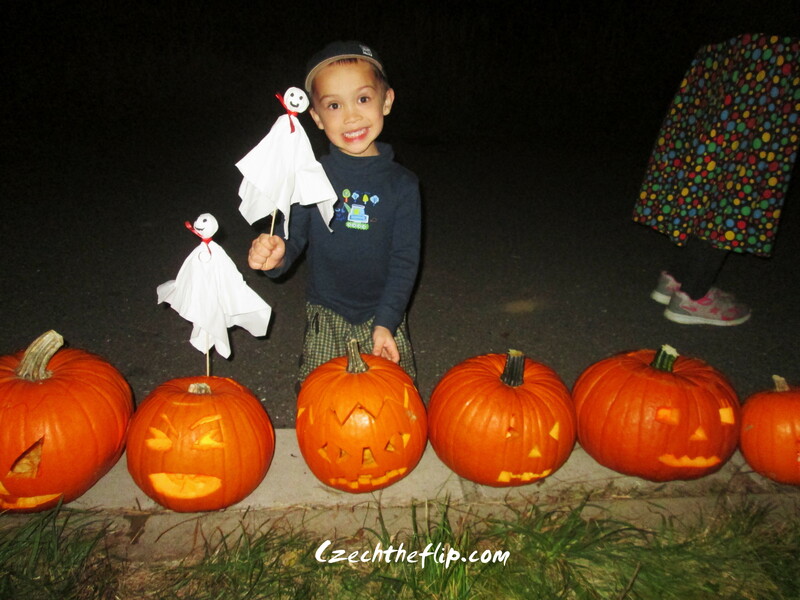 When darkness crept in, we lighted the pumpkins and displayed them in a single line on the side of the street. Here is my son proudly posing with the pumpkin that him and his father carved. We were blessed with perfect weather that day. It was not too hot nor was it too cold. And there was no rain! The event was culminated with a short walk in the woods with the young kids. That means us because both our children fall into the young and gullible category. It was like going into a haunted house except that it was open-air. The organizers prepared a short trail where the older kids and some parents dressed up as ghosts, monsters, and whatever “i-will-scare-your-wits-off ” costume you can think of and tried to scare the younger ones. At the very end, a pumpkin full of candies awaited the braver ones. Fortunately, none of our kids got scared. But it was a very interesting walk for them — and for us. There was no “trick or treat.” But I didn’t miss it that much. Because I’ve never really been to a “trick or treat.” I was already way too old for it when I moved to the States. Back in the Philippines where I grew up, the practice was not customary. It is the same over here in the Czech Republic. 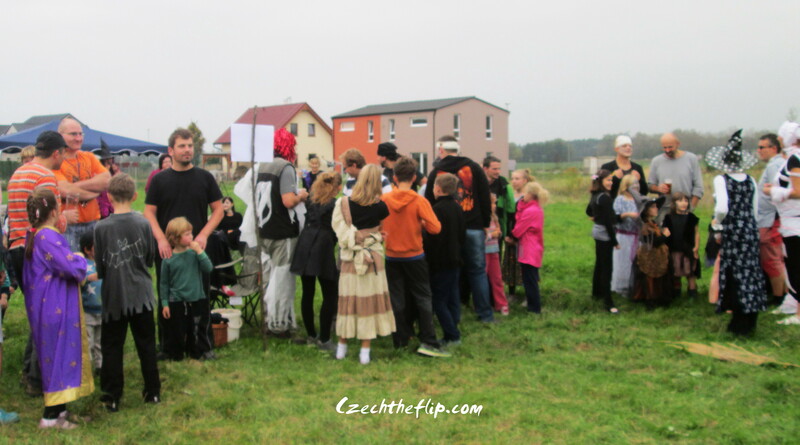 Even though adults and children love to dress up and scare each other during halloween, they haven’t gotten around the practice of doing a “trick or treat.” Albeit, there is a street in Prague where the “trick or treat” is being practiced. But it is where most American expats live, and they have managed to keep the tradition alive. Anyhow, my little community’s helloween celebration was enough for me. 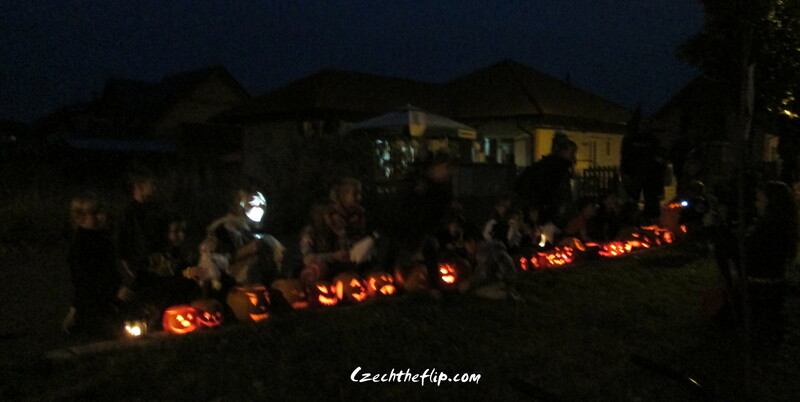 I’m glad that my children got to experience this western tradition with a Czech twist. Gorgeous pic of your son with the pumpkin. 🙂 Thanks for sharing your ‘Helloween’ pics. I enjoyed seeing how your community celebrates this festival. That’s one long table of tasty desserts! I spent halloween at home, listening to other people partying – not really something we worry about too much here in South Africa. Hello Kabayan!, I’m Filipina also living in Olomouc, Czech Republic. I’m just new in this country. Can we keep in touch?.. My name is Joe Pinzone and I’m casting an international travel show about expats moving abroad. We’d love to film in Czech Republic and wanted to know if you could help us find expats who have moved there within the last 15 months or have been there for 3-4 years, but recently moved into a new home. The show documents their move to a new country and will place the country in fabulous light. The contributors on the show would also receive monetary compensation if they are filmed. If you’d like more information, please give me a call at 212-231-7716 or skype me at joefromnyc. You can also email me at joepinzone@leopardusa.com. Looking forward to hearing from you. I had to like. could not resist myself- the skeleton in the coffin.